Am I the only one who feels excited at this opportunity? Imagine being a part of a conversation where, for the first time ever!, ECE, primary, intermediate, secondary and tertiary educators are "working together" to achieve a common goal? I am hugely excited about this. So why the scowly faces around my table? Am I missing something? "How was your day at school Nic?" Eventually, I turned out fine, yes. The influential people in my life steered me to take the leap into "Teacher's College" (College of Education) and the rest is history. But my experience at high school could have been quite different. 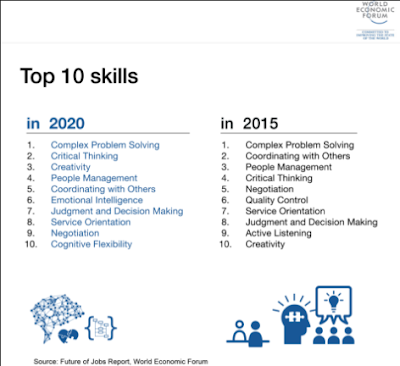 So here are the Top 10 Skills identified in order to thrive in today and the future. Do you notice the word exam here? I just googled "the purpose of education" and was flooded with inspiring quotes that had nothing to do with the teaching of tests but the preparation of life. Recently this year I watched "Straight Outta Kawerau" - a story about one principal's inspirational journey to turn a community around. Their story was so powerful, I cried. I sobbed! Tears of joy bubbled down my smiling cheeks. I couldn't help but wonder what my learning experience would have been like under these conditions? How could I have focused on my curiosities about the world and create something using my passions? Music, art, media studies, photography? So this is why I feel incredibly excited about Communities of Learning. Being involved in something that could truly change the course for all learners (not just learners like me) all around New Zealand. I was drawn to your post here...all relevant whakaaro in the light of what I see is the potential for CoL's as a way to reimagine TTWWADI. I have watched Miss 18 disengage in school (although she loves learning and wants to be a P.E. teacher). I am currently watching with dismay as Miss 13 disengages too. "Why do I go to school?" she comes home everyday and asks me! I am LIVING this and it kills me. Thanks for writing this as I was beginning to think I was alone in thinking that there is potential with CoL's ... just need a collective vision and some inspiring people ... it won't be quick but it is a start. WE MUST START - there is a sense of urgency now I feel. I will follow your CoL's journey with interest (hoping you continue to blog). Tena koe. Absolute potential Nic. Why I have come to be a strong proponent of the Magic of Area Schools, and therefore see the potential in COL's. Yes, we need to be really ware of where those triggers for disengagement occur and be prepared to do something very different with learning to re-engage all those learners who disengage- and then either leave the system all together or are completely turned off like Kerri outlines above. I do wish some secondary school were more aware of what was happen gin in primary schools and then freed up to capitalise on that- just like some primary teachers need to e much more aware of what's happening in ECE! Hopefully COL's will help these conversations!